The next step in my cheesemaking journey is to start learning about rennet cheeses by making Chèvre. 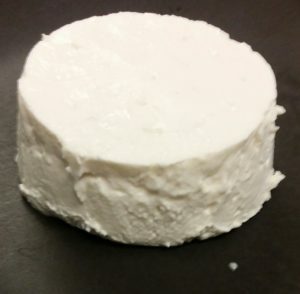 Chèvre is known as a lactic acid set cheese fitting between simple lactic acid set yogurt cheeses and more complex rennet set cheeses with elements of both styles of cheesemaking. The process of Chèvre making involves a long, slow fermentation that brings out the best flavours of goat’s milk. Traditionally backslopped whey was used to culture goat’s milk when making Chèvre. If you don’t have access to raw milk you won’t be able to do this so there are two other options. Firstly you can buy commercial mesophillic freeze-dried starters containing laboratory raised bacteria. The second option is to use Kefir to restore microbiological diversity to pasteurised goat’s milk. This technique apparently leads to a more flavourful raw milk like Chèvre. I’ve just ordered a milk Kefir starter kit and I’ll write a bit more about this technique when I’ve had a chance to try it out. For my first attempt at Chèvre I used a commercial freeze dried Chèvre culture with rennet included. Although all my research described Chèvre as an easy, forgiving method of cheesemaking it didn’t quite go to plan for me. I heated my 4 litres of milk to 30ºC, added my culture, waited for 2 minutes, stirred and then left to ferment for 12 hours at room temperature. I did have some curd, with a yogurt like consistency as the recipes I have read described. There wasn’t as much curd as I was expecting and I think that might have been because the room temperature was a little cool. Having done some research since the advice I found was to add a little heat if there seems to be a lack of curd. I did leave my curd to drain overnight and then added some salt. This is where I made a bit of a schoolboy error. I didn’t take into account the reduced amount of curd I had and didn’t reduce my amount of salt accordingly. The Chèvre was still quite sloppy so I put it in a cheese form and left it in a bowl in the fridge to drain a bit more liquid. I was pleased with the consistency. It smelt like a creamy goat cheese the problem was the amount of salt I had added, it was horribly over salted. I did eat some and there was a hint of delicious, creamy goat cheese in there but it was just ridiculously salty. The following day I decided to try again. I decided to try heating my milk on our cooking range, rather than the induction hob, and then moved it to the warming plate on the range. Unfortunately I underestimated how warm the range would get and basically ended up pasteurising the milk, therefore killing off the culture. I’m hoping it will be third time lucky this week. I’m going to warm the milk on the induction hob and then keep an eye on the curd development applying a gentle heat if necessary which I hope will lead to more curd development. Of course I’ll also be more careful with the amount of salt I add. When I was trying to figure out where I had gone wrong I found this Trouble shooting guide for homemade cheese helpful. This entry was posted on Sunday, July 2nd, 2017 at 8:48 pm and is filed under Blog, Cheesemaking. You can follow any responses to this entry through the RSS 2.0 feed. Both comments and pings are currently closed.